The skin is the largest organ in the body. It makes sense, then, why its condition is affected by so many body systems, including the lymphatic system, the circulatory system, and the nervous system. Needless to say, your skin works hard, and it deserves plenty of tender lovin’ care. Along with juicing, hydration, exercise, and a holistic diet with whole, real foods, dry skin brushing is a simple and easy technique you should add to your daily wellness routine. 1. Start with a dry, natural bristled brush. 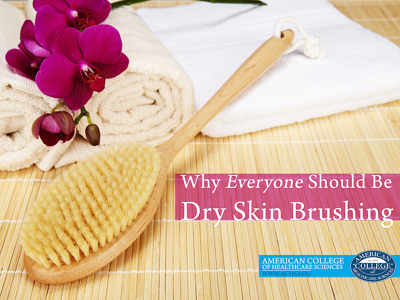 Of course, the key word in dry skin brushing is dry. Never wet your brush. Water can lubricate your skin, eliminating the therapeutic effects of friction. Use a natural bristled brush with a long handle (so you can reach the skin on your mid and lower back!). Natural bristles are important because nylon—or synthetic—bristles can break your skin, disturbing the delicate electromagnetic balance. 2. Start with the feet, work toward your heart. 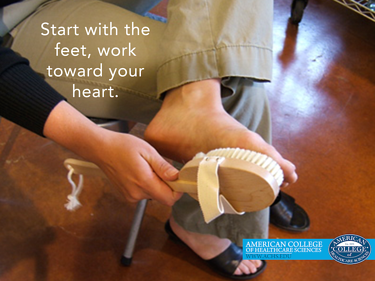 For optimal circulatory stimulation, start at the bottoms/soles of your feet and work toward your heart. 3. Dry brush in small circles. Find a place where you feel comfortable, safe, and relaxed. 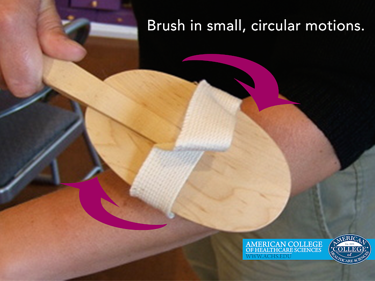 In small circles, brush all over your body on bare skin. You may want to begin near a lymph node and then move to the outer extremities, working back toward that lymph node. Keep the pressure soft until you are used to the feeling of dry skin brushing. Once the sensation becomes familiar, you can increase pressure as desired. 4. Be sensitive to tender areas. Don’t feel you need to dry brush over any areas that are sensitive or inflamed. Focus on areas of your body that feel whole and healthy. You also do not need to dry brush your face since the skin is very sensitive and the bristles can be too harsh. 5. Add hydrotherapy and aromatherapy elements. One way to enhance your dry skin brushing experience is to add a hydrotherapy treatment. After you’ve brushed, hop in the shower and alternate hot and cold temperatures (be very careful not to scald yourself…turn the hot water on slowly). The varying temperature continues to stimulate circulation, but if you feel the variation is too intense, a regular shower works just fine to finish off your dry skin brushing routine. You can also follow up your brush routine with a salt or sugar scrub once or twice a week. To make your shower scrub, add ½ cup sea salt, Epsom salts, or sugar to olive or sweet almond oil until it forms a wet paste. I prefer sugar as it seems to be more moisturizing. Add a few drops of your favorite essential oils for an extra boost of aromatherapy. Scrub all over your body, careful to avoid eyes and other sensitive areas. Rinse thoroughly. 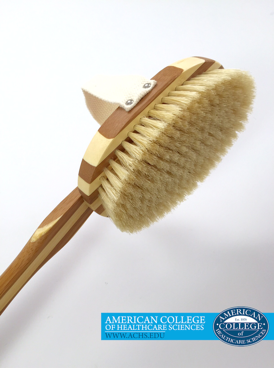 After dry skin brushing every day for a few months, you’re sure to notice the benefits. I’ve found that if I go a day without dry skin brushing, I miss it! Give this easy technique a try for a week and see how you feel—then let me know how you like it in the comments. You’re skin will love you for it.